The Saints are back and have their sights set on bringing another Super Bowl trophy to New Orleans. Led by a high octane offense, the Saints are ready to take the reigns of the NFC South. Division rivals, Atlanta Falcons and the Carolina Panthers will attempt to halt New Orleans' aspirations. They finished the 2017 season 11-5 qualifying them for the playoffs. The Saints faced the Minnesota Vikings in the NFC Divisional Playoffs but lost in a dramatic ending 29-24. Will 2018 be the year for the Saints to go all the way? Grab your New Orleans Saints tickets and head over the Superdome to be part of championship charge. Established in 1966 and having played their first season in 1967, the New Orleans Saints have their roots deeply entrenched into the Catholic faith. The Saints refers to the All Saints Day celebrated on November first. This also happens to be the date when the football team for the city of New Orleans was founded. Considering the importance of the date and the predominant Catholic population of the city, the football team was named the New Orleans Saints. The New Orleans Saints are member of the National Football Conference (NFC) South Division. Super Bowl Champions in 2009, the Saints have one Conference Championship and five Division Championships under their belt. With ten playoff appearances, the last time the Saints made it to the playoffs was in 2013. 2017 looks like the year when the Saints will go all the way. There are quite a few reasons for this prediction. The first reason is 6-foot-4, 287 pound athlete Cam Jordan. This first round draft [pick defensive end has been getting better and better. Another reason is Marshon Lattimore. This Ohio state cornerback is expected to start this season and make his presence felt for sure. Saints fans often belt out ‘When the Saints Go Marching in’ at games to reinforce their belief in the Catholic faith and their football team. Here are some of the moments when the Saints showed the rest of the NFL they were the chosen ones. NFC Championship Game 2009 – The Mercedes Benz Superdome on January 24, 2010, was set for an epic faceoff between Brett Favre and the Saints defense. With the game tied and little time left in the fourth quarter, Favre went for a game winning drive. Saints CB Tracy Porter had other plans. His interception at the Saints 22 yard line was decisive and allowed the Saints to push the game into OT. Drew Brees and Pierre Thomas guided the ball to the end zone and kicker Garrett Hartley lined up a 40 yard field goal to win the game for the Saints 31-28. The Saints Return – After the devastation of Hurricane Katrina, football and the New Orleans Saints returned to the Louisiana Superdome on September 25, 2006. The stadium that had provided shelter to the residents of New Orleans was tasked once again to protect them. However, this time it was to protect an entire city’s hopes and dreams. By defeating the Falcons 23-3 that evening, the Saints reaffirmed the resilience of an entire city and that of the football team that would never give in no matter how big the challenge. Falcons – Saints Rivalry – The Atlanta Falcons and the New Orleans Saints are traditional rivals in the sense that they play for the same Conference and Division. In addition, the Falcons and the Saints are geographically considered to be the Deep South. They played their first game in 1967 and since 1971, these two teams have played against each other at least twice. No two teams have played more games against each other than the Falcons and the Saints. With 95 games in total, the Saints are a little behind with 45 wins against Falcons 50 wins. Buccaneers – Saints Rivalry – Since 2002, the Tampa Bay Buccaneers and the New Orleans Saints have been members of the NFC South. These evenly matched teams have one Super Bowl Championship a piece, one Conference Championship a piece and the Buccaneers lead the Division Championships by only one. The two teams have met each other on 50 occasions with the Saints winning 31 of those encounters. The Tampa Bay Buccaneers went without a win for their first two seasons. It was their first game with the New Orleans Saints on December 11, 1977, the Buccaneers recorded their first ever franchise win by trouncing the Saints 33-14. During their 50 year history, the New Orleans Saints have had many exceptional athletes on their roster. For the Saints their greatest list starts with Super Bowl winning QB Drew Brees. This Austin, Texas, resident was signed by the Saints as a free agent in 2006. Since then, he has become the leader in passing yards, touchdown passes and pass completions. He also ranks third in the NFL in the mentioned categories with 63,303 passing yards, 5,552 pass completions and 445 touchdown passes. Rickey Jackson is another Saint who from 1981 till 1993 helped the Saints achieve new heights. The University of Pittsburgh linebacker has the most tackles in Saints history 1,104. In addition, Jackson also had the most sacks 115 and most forced fumbles 38. He was a six time Pro Bowler and four time First Team All Pro. QB Archie Manning is another name that the New Orleans Saints are proud of. Having spent ten seasons with the New Orleans Saints from 1971 till 1982, Manning is a respected and revered figure in New Orleans. Considered by many as the face of the franchise, Manning’s achievements include two Pro Bowl picks, NFC Offensive Player of the Year in 1978 and two Super Bowl winning QB sons. The Mercedes Benz Superdome is an absolute must for any Saints fan trying to take in a home game and experience the city of New Orleans. Adjacent to the French Quarter, the stadium allows fans to experience the culture of the city before and after Saint games. If you’re looking for New Orleans Saints 2018 tickets, you’ve come to the right place. Get your tickets and watch as the Saints take it all the way to the end zone this season. Our process for purchasing cheap New Orleans Saints tickets is simple and fast. There are so many online ticketing sites, that it can be hard for customers to find the right place to buy New Orleans Saints tickets at the cheapest price. At ScoreBig we think of our customers first and foremost. We offer daily deals for New Orleans Saints events, so our customers can get the best seats for the best prices. ScoreBig will always go above and beyond to offer the cheapest New Orleans Saints tickets on the market. The New Orleans Saints schedule above, displays all available events for 2019 and 2020. Once you find the event that you would like to go to, click the red “Get Tickets” button. It is located on the right-hand side of the event listing, it will take you to an New Orleans Saints event ticket page. ScoreBig's event ticket page will display all available New Orleans Saints tickets for that event. On the event ticket page to help with your search for the right New Orleans Saints tickets, use the filters at the top to select quantity, price range, and more. There is also an interactive seating chart so you can pick where you want to sit. When you are ready to buy a ticket, click on the listing, and you will be directed to ScoreBig's checkout page. Upon completion of the information fields, your order will be processed and your New Orleans Saints tickets will be delivered via email, mail, or to your mobile device. What makes ScoreBig’s site stand out from the rest? We are constantly analyzing our competitors to improve our site, service, and prices. ScoreBig.com employees strive to offer the best process and experience to buy cheap New Orleans Saints tickets. Our goal is to get you the best seats to New Orleans Saints events. We offer daily discounts on our site and for special promotions check out our newsletter. If there are no New Orleans Saints events currently available, you can use our search feature at the top of the page to see a list of all popular events going on near you. No matter your price point, we have all the best deals and discounts on New Orleans Saints tickets. For more information on prices of New Orleans Saints tickets and the schedule for New Orleans Saints, check out our listings above. The last thing you want to find out is when the New Orleans Saints event you wanted to go to is sold-out. Don’t worry in many cases ScoreBig has affordable tickets to sold out events. We sell tickets from GA all the way to premium seating and parking. Skip the scalpers in the parking lot and get your tickets online from top New Orleans Saints ticket brokers. We get you in all events, buy your New Orleans Saints tickets here from a brand that many trust and rely on for all their ticketing needs. ScoreBig offers a 100% money-back guarantee. If you have been in search of cheap tickets for New Orleans Saints, ScoreBig by far is the best option. That’s why ScoreBig has more loyal customers than any other ticketing site. 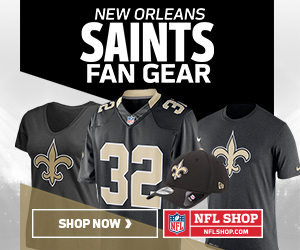 Shop at ScoreBig for safe and secure New Orleans Saints event tickets.